I managed to get two placemats finished to the binding stage on our first Friday Night with Friends (FNWF) …. These are for our Guild’s Meals on Wheels Christmas giving project. and finished the bindings up yesterday. Using mini panels made them super fast to make and quilting them with my walking foot was a breeze! Thanks Chez for bringing us together for a productive night in…. looking forward to many more to come! 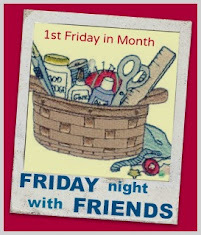 Now, to go and visit some Friday night friends to see what they got up to! Why don’t you come with me??? HERE we go……! Great job. They will bring lots of joy to their recipients. A beautiful gift idea and gorgeous panels. Very cute! I love the butterfly fabric! I love to use panels for baby quilts, so quick and easy! These look *GREAT* Wendy!!! ... And what a fantastic cause you've made them for!!! ... See you next FNSI/FNWF?!! Hugs!! what a lovely idea to make placemats for your Guilds Meals on wheels Project..
Those are just so pretty, Wendy, good job! You are *always* such a generous giver!